Cruises have become one of the most favourite holiday and travel activities amongst Australians. What could be more enjoyable than relaxing on board of a cruise ship? Picturesque coastlines, sand-kissed beaches and spectacular skyline views of port cities like Sydney, Melbourne or Perth. Fantastic food and tropical drinks make your stay on board of a luxury cruise liner even more pleasant. Have you ever dreamed of discovering Australia seaborn? Or are planning to cruise Australia or even the World this year? If so, there are fantastic cruise deals available from CruiseAway Australia. Why not enjoy all the amenities on board of a modern cruise ship and still save with the latest CruiseAway cruise deals, collected for your here at CouponDeals.com.au? Browse the latest and greatest cruise deals and promotions in our list below. Then connect straight to CruiseAway’s website to benefit from the cruise expertise of CruiseAway’s cruise travel experts. Want to read more about CruiseAway.com.au’s services? 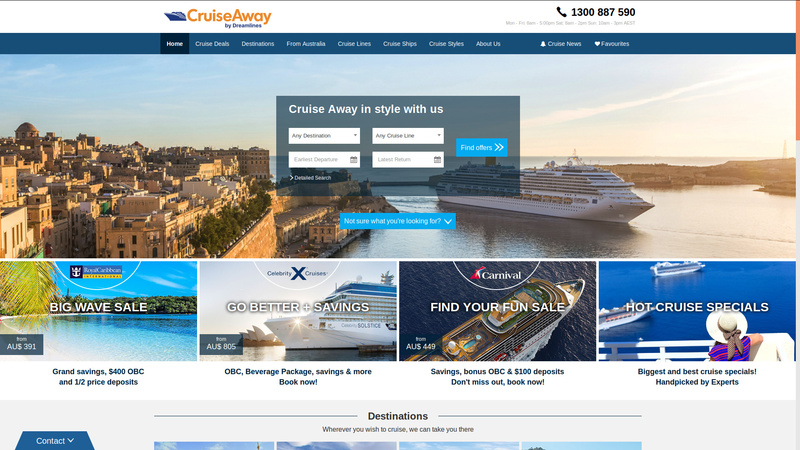 Scroll down the page and find out how to save on cruises with CruiseAway and why to book with Australia’s premier online Cruise Travel Company. If you’re new to cruising and want to test the waters, why not start with an exciting cruise with departure from one of our Australian ports. Destinations of CruiseAway’s cheap cruises offer can even be New Zealand or the South Pacific! Save hundreds of Dollars with unbelievable great rates on last minute cruises departing in 60 days or less! Have a week off unexpectedly? Maybe, you’re not quite sure where to travel? Why not browse the latest last minute cruise deals at CruiseAway? But act quickly because deals wont last long! See the latest and greatest cruise line deals and save up to 70% and more! Australian based Dreamlines Australia Pty Ltd, the operator of CruiseAway.com.au, is a subsidiary of Dreamlines GmbH based in Hamburg, Germany, which is Europe’s leading online cruise travel agency. With this sort of international presence, CruiseAway have access to cruise offers and deals from dozens of cruise lines. Amongst them are world-famous cruise brands like Oceania Cruises, P&O Cruises, Royal Caribbean, Carnival Cruises Australia, Celecbrity Cruises, or APT. Cruise Experts at CruiseAway have access to all kinds of cruise ships. From famous cruise ships like the Carnival Spirit, the Astor or the Oasis of the Sea to expedition ships to small luxury yachts, your cruise expert will find the best cruise ship for your travel needs. All of the cruise ships available amongst our cruise deals meet the highest standards when it comes to safety and service. Check out the detailed descriptions of each ship as well as numerous ship photos and even exclusive ship videos. The variety of ships and cabin options suit every travel budget. Cruise consultants at CruiseAway assist you in advance to find the right cruise ship, cabin option and of course itinerary for your cruise travel plans. Australia is one of the most popular cruise destination for many cruise tourists from all over the world. The worlds best beaches, exciting and vibrant cities and spectacular coastal landscapes and maritime treasures like the world famous Great Barrier Reef inspire Aussie travelers alike. No wonder, that Australia short trips or round trips are the most favourite choice of Australian cruise travelers. Melbourne: Watch sports at the famous MCG, enjoy culinary delicacies on the water- and riverside areas, witness beauties of the nature at Port Campbell National Park or discover Melbourne’s exciting nightlife downtown and in famous nightlife districts like St. Kilda or Fitzroy. Sydney: Visit Sydney’s icons, the Opera House and Harbour Bridge. Enjoy modern Australian fusion kitchen in one of the award-winning restaurants downtown and have a great time at Bondai Beach. Brisbane: Climb Story Bridge for amazing views of Queensland’s capital, Explore the city on the famous CityCat ferries or enjoy dining in Brisbane’s amazing restaurants offering fine food and Australian wine. Darwin: If you have a chance, get on a tour to nearby Kakadu National Park. Appreciate breathtaking nature on a Mary River cruise and attend vibrant outdoor festivals and markets. Perth (Freemantle): Dive in the laid-back nightlife atmosphere of the 4th largest Australian city with its many restaurants and cafes. Explore the city-centered Kings Park which reveals stunning views over the city. If you like wine tasting, don’t miss the Swan Valley for some of Australias finest wines! Adelaide: Wine enthusiasts will enjoy Adelaide a lot, too. Take a trip to wineries in famous Barossa Valley nad Clare Valley. Friends of nature can enjoy a swim with the dolphins in Glenelg. Adelaide’s impressive Botanic Garden is well worth a visit at anytime. Hobart: Tasmania’s capital city of Hobart is located at the foot of 1,270 high Mount Wellington. Australia’s second oldest city is now home for some 200,000 inhabitants and is always worth a visit. Fly Cruises: That style is what CruiseAway is made for. Enjoy a hassle-free planning and booking process because flights are included in this travel packages. Luxury Cruises: The most comfortable way of cruising comes with the highly personalised services of a luxury cruise. From cultural and entertainment hilights to culinary delights, everything is included in your luxury cruise. Family Cruises: Couples and families wanting an inspiring trip for a little less may enjoy budget cruise holidays. Expect kids activities, leisure facilities, quality accomodation and similiar pre-paid offers on these cruises. River Cruises: The name says it all. There may be no better way to discover vibrant cities and exotic places then on board of a river cruise ship. Australia Cruises: Immers yourself in the homeland and discover the places you’ve always wanted to visit. Australia cruises are very popular these days and start from 2 day city trips to extended around the coastline adventures. Folks at CruiseAway love cruising! Having been in business for 16+ years, the cruise travel company believes that there’s a perfect cruise holiday out there for every Australian. What makess CruiseAway special for your booking needs is, that their cruise consultants will book not only the cruise itself, but also take care of all pre-cruise and post-cruise travel requirements. There are a number of web sites offering cruises out there. Please consider, not all of them are based in Australia and as such may not provide the same level of quality and protection as fully licenced CruiseAway does. The cruise expert company is member of the Cruise Lines Association of Australasia (CLIA), if a fully accredited member of the Australian Federation of Travel Agents (AFTA Membership No. 11090) as well as an approved participant in Australian Travel Agency Standards (ATAS Accreditation no. A11269). Your benefits from finding cruise deals and booking your cruise with CruiseAway are discounts up to 70%, free expert advice, world renowned cruise partners and a lowest price guarantee. With this top performing online cruise travel agency you’ll most likely get better rates than when you book directly with a cruise line.